Pilgrim Scribblings: The Local Church is Dying? There are a few blogs which I check every day. Paul Wilkinson's Thinking Out Loud is one of those. I have it listed in my Blog List along the right hand side of Pilgrim Scribblings under "Thought-Provoking Blogs". Paul's post are always that...that make me/you think...and ruminate. Today's post is very revealing but I'm not surprised by what many of us suspected. 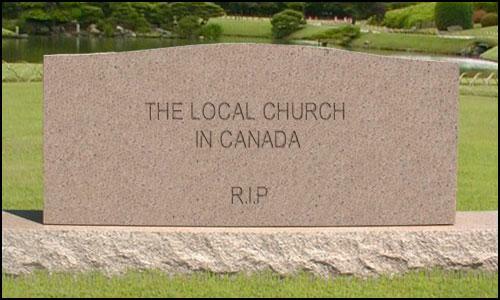 The local church here in Canada in comparison with our counterpart south of the border is struggling for it's life. Thankfully the "real" Church, the body of Christ, will never die and the gates of hell will never "prevail" against it. Paul writes: I’m kinda off schedule today and this post, and possibly tomorrow’s, are a little late appearing. Part of this is due to a two hour conversation I had last night with the man who hired me for the only local church position I have ever held. (All my other jobs have been with parachurch organizations, or related to Christian publishing.) It was the first time in about two years we’ve talked; probably the longest stretch we’ve had without contact. I have more take-aways from that call — my former boss is very knowledgeable on church-related things — than I list here, but one thing that struck me is how fragile the local church is in Canada. A consequence of this is that because things are so tenuous here, there are very great disparities between regions, even within the same province. And the French-language church in Quebec is a story unto itself with many different dynamics. I’ve long known about the Canadian “Bible Belt” in Western Canada, and a mini-version of it in Western Ontario; but I didn’t know the degree of contrast between, for example, Windsor, Ontario and Oshawa, Ontario. I didn’t realize the degree to which the church is in decline in parts of Canada while seemingly growing in other parts. He told me a story of a church plant which mailed out 80,000 advertising pieces and failed to attract one single person to the launch service. All this comes just days after Outreach Magazine released another one of its lists of the Top 100 Churches in the United States. Why don’t we have a list like that here? As I looked at the U.S. data, I realized how little I know about Canada. I’m aware of two or three mega churches here in Ontario; I know the Alliance has some large churches in Alberta; I think there’s something Hillsong-related in Winnipeg and perhaps a large Pentecostal church or two in Vancouver; but I’m realizing how totally ignorant I am about my own country. I thought perhaps knowing who the top ten are — at least — might be interesting. I can’t begin to guess who they are; let alone name the church, city and pastor. I’ll bet most Canadians know more about NorthPoint and Willow Creek and Lifechurch than they do about… whoever they are up here. I’d just like to counterbalance the U.S. data I’m bombarded with. But then I get a call reminding me of the other side of the story, that there are far too many small, hurting, struggling, hanging-by-a-thread churches in Canada; and with them a lot of frustrated, discouraged, burned-out, ready-to-give-up pastors. The rate of attrition is high and climbing. While sending out missionaries to third world countries is important, I think Canadian Christians need to be aware of the needs here at home. It’s so easy to get swept up in U.S. Evangelical culture and just assume that we’re an extension of that. We’re only, at best, very distantly related. Very interesting information. I can imagine with the recession, people are barely hanging on by a thread, that giving would be down too.